The "Royal Purple Heart"diamond gets it's name from two important characteristics of the stone, the color and the shape, both of which are unique for this diamond. 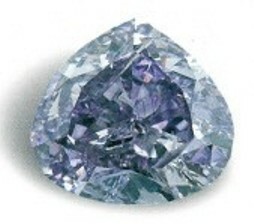 The unique purple color of the stone is an extremely rare color among diamonds, as rare or even rarer than red color in diamonds. the perfect heart-shaped cut of the diamond brings out the brilliance of the natural purple color of the stone. Thus the two unique characteristics of the stone, the color and the shape, have been appropriately combined together to give the name of the stone. The diamond is a fancy vivid purple, I-1 clarity , heart-shaped stone weighing 7.34 carats, and it is the largest fancy vivid purple diamond known to exist. The Purple Heart diamond is believed to have originated in Russia, and the rough stone was cut into it's perfect heart shape by Julius Klein Diamond Corporation. Besides the above facts nothing else is known about this unique diamond. Even the present owners of the diamond are not known. Purple and red colors are the rarest of all colors in naturally colored diamonds. The rarity of these colors combined with their exceptional beauty, make these diamonds the most expensive and much sought after diamonds in the world. An interesting feature of these rare diamonds is that the rarity of the color is always combined with the smaller size of the stone. The world's 1st, 2nd, and 3rd largest red diamonds are only 5.11, 5.05 and 5.03 carats in weight respectively, and most of the rare red diamonds are less than one carat in weight. Like wise purple colored diamonds are also smaller in size. The "Royal Purple Heart"is only 7.34 carats in weight. Purple diamonds of over 5 carats in weight are very highly prized and are as expensive as red diamonds. Diamonds are crystalline forms of Carbon, in which the crystal unit consists of a Carbon atom surrounded by four equidistant Carbon atoms, at the four corners of a regular tetrahedron. This unit is repeated forming face-centered cubic unit cells. Diamonds crystallize in the isometric crystal system which eventually result in the octahedral and cubic crystal forms commonly seen in naturally formed diamond crystals. Diamonds originated deep inside the surface of the earth about 200 Km below the surface in the earth's mantle, at least 3 billion years ago. The crystals subsequently rose to the surface of the earth along kimberlite and lamproite pipes. During the formation of the diamond crystals, certain other atoms, besides Carbon, which had atomic sizes comparable to that of carbon, such as Nitrogen and Boron, were also incorporated into the crystal structure as impurities. Nitrogen was the commonest impurity that entered the structure of diamonds, so much so that almost 98 % of all naturally occurring diamonds contained trace quantities of Nitrogen (less than 0.1 %), imparting a range of yellow colors to diamonds, from a slightly yellowish tint to the more intense yellow colors, such as the canary yellow, depending on the concentration and distribution of Nitrogen atoms. Such diamonds, that contain detectable quantities of Nitrogen are known as type I diamonds. Therefore only 2 % of all naturally occurring diamonds do not contain Nitrogen, and such diamonds are known as type II diamonds. However a very small percentage of type II diamonds (0.1 %), can contain trace amount of Boron atoms as impurities, which impart a blue color to the diamonds. Such diamonds are known as type IIb diamonds. The remaining type II diamonds are free of any impurities or contain undetectable quantities of Nitrogen and are generally absolutely colorless. These diamonds are known as type IIa diamonds. D-color diamonds or top-color diamonds come under this group. A very small percentage of type IIa diamonds, may have undergone plastic deformation of the crystal structure due to twisting and bending of the tetrahedral units as the crystals rose to the surface from the earth's mantle. Such deformed areas in the crystal can absorb visible light in different regions of the spectrum imparting rare fancy colors to diamonds such as pink, red, purple, orange, brown etc. Such diamonds are also less than 0.1 % of all naturally occurring diamonds. Therefore purple diamonds are plastically deformed type IIa diamonds.